Ibadan – Mrs Adebola Ishola, wife of the late renowned playwright, Prof. Akinwunmi Ishola has said her husband gave no sign that he was going to die anytime soon. She told newsmen in Ibadan on Saturday evening that Ishola took a spoonful of custard on Saturday at 9 a.m and repeatedly said: ‘Thank you my wife’, before he gave up the ghost moments after. 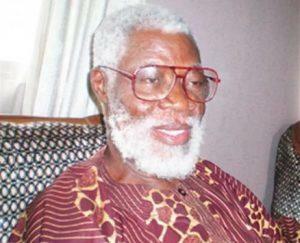 Ishola died at exactly 9.30am in his Akobo residence in Ibadan on Saturday. The widow said that Ishola had on Friday night taken ‘ amala (food from yam powder) and bean soup’ dished for him. The widow said that she was worried when he took just a spoonful of custard because he used to eat very well, saying that prompted her to immediately call the doctor. “He sat on the chair in his room upstairs. He did not say more than “Thank you my wife’. The nurse and I laid him on the bed. He immediately gave up the ghost. NAN reports that two among the children of the deceased, Akinjide Ishola, a Lagos-based legal practitioner and Mrs. Oluwatoyin Shomefun arrived Ibadan on Saturday. Among the early callers at the deceased residence were Mr Toye Arulogun, Oyo State Commissioner for Information, Culture and Tourism, Emeritus Professor of Linguistics at the University of Ibadan, Ayo Bamgbose and a businessman, Dr. Lekan Are. The post Thank you my wife, Professor Ishola said before he gave up the ghost – widow appeared first on Vanguard News.